Not since Tom Coughlin’s departure has there been one person who could regularly speak with clarity and conviction – and personality – about the decisions being made by the organization. The only thing more entertaining these past few days than listening to Dave Gettleman speak to reporters was watching Pat Shurmur while Gettleman spoke to reporters. As the general manager wove in and out of anecdotes and one-liners with the agility of a three-cone drill at the Combine, Shurmur, the straight man of the two, sat beside Gettleman wondering what would come out of his mouth next. His eyes would open wide at some remarks, look around in confusion at others (especially when Gettleman dropped a word or two in Yiddish), and a smile would even cross his face once in a while. He also provides the Giants with something that has been missing from the Giants for a number of years: A voice. Not since Tom Coughlin’s departure has there been one person who could regularly step in front of the cameras and notebooks and speak with clarity and conviction — and personality — about the decisions being made by the organization. It was something general manager Jerry Reese never expressed much interest in handling, and he didn’t have to with Coughlin there. But it was something coach Ben McAdoo never quite mastered and it created a messaging vacuum. A team needs someone who can speak for the organization, and for the past two years they lacked that drum major. The Giants learned that the hard way. Now they have regained their voice. It’s one that drops words like meshuggener and bupkes into conversations with a Boston accent and tells stories from the past like Grandpa Simpson. It’s one that is expressing sentiments that some fans and reporters may not agree with when it comes to the future of Eli Manning and the role of analytics in player analysis. But it’s a voice. While he may get some names and numbers wrong when he tries to make conversational connections and may sometimes say things he probably shouldn’t (like the fact that he wanted to trade up for a player who was eventually there when the Giants selected anyway), he’s a lot more shrewd than his act comes off. Take his performance at last month’s league meetings, for example, when he danced the Odell Beckham Jr. jig about the possibility of trading the star wide receiver without ever directly saying what he intended to do. After he spoke with reporters that day in Orlando, co-owner John Mara walked by and asked how it went. Told that Gettleman left half the crowd believing that Beckham would be traded before dinner and the other half convinced that he would be a Giant for life, Mara smiled. Those are the kinds of things that Shurmur can handle — during the season he’ll have to do it a lot more often — but Gettleman does more naturally. 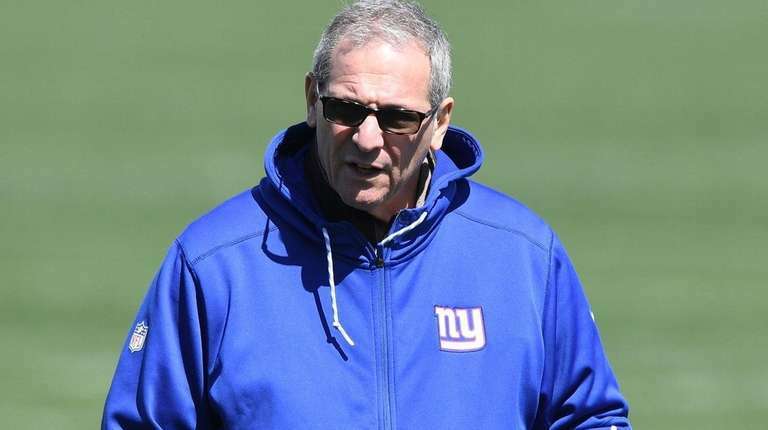 Gettleman’s string of sound bites began on the opening night of the draft when he walked into his very first news conference, sat in his seat, and was nearly poked by the microphone. “I’ll get this thing stuck up my nose,” he grumbled. Then he talked about teams wanting to trade for the Giants’ No. 2 overall pick. By Saturday he was asked to assess the entire draft class. He even, at one point, tried to give credit to Shurmur for a line about signing undrafted free agents. “Like Pat says, you don’t win a toaster for being the first team to get to 90 players,” he said. Shurmur almost refused credit. He knows who the star of the news conferences is supposed to be. Whether or not Gettleman continues in the spotlight now that the draft is over remains to be seen. He’s gotten a taste of it with the Giants for the first time ever after almost an entire career in the background of the front office for the organization. Perhaps from this point on he’ll speak sparingly but carry a big schtick. One thing is clear, though: Gettleman loves this part of his job. And he relished it these past few days. It’s easy to do that when you get to use the second overall pick in the draft without having hands dirtied from the filth of the previous season that delivered said status. Or when the team has not lost a single game under your leadership. At some point, Gettleman will make a misstep. Perhaps he has already in this draft and we don’t know it for sure just yet. For now, though, it’s all a hoot. So, too, did Shurmur, who had the best seat in the house for the comedy and football stylings of Gettleman for three days in public and the past few weeks of draft prep meetings. The two men whose personalities could not be more different and who knew very little about each other up until about five months ago now play off each other with the chemistry of a good quarterback and receiver combo. “You never know what you’re getting into,” Shurmur said of what was in store for him. Now, after his first draft with the Giants and Gettleman, he has a better idea. Maybe just to see what he’ll say next year.